Male fukave ei i ia ti no’a o ei kau! 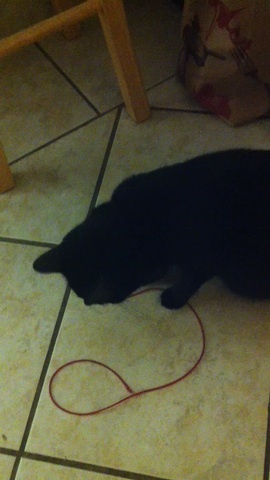 I may previously have mentioned Keli’s precious red string (both her enemy and her dearest friend), and may have even included a picture of it, but now I’ve got a video of Keli and her red string in action! And that’s not even her at her most vicious. She’s can go after that string with gusto! I forget when I came up with today’s word, but it was specifically inspired by a dog whose hair is standing up on end. I remember my old dog Brandy was the most mild-mannered and lazy beagle the world had ever known. One day, though, I jumped over the fence to get into the house (forgot my key), and she was there snarling with the hair standing straight up on her back, and was so ferocious she didn’t even recognize me at first. Even when she did recognize me, it took her a full minute to calm back down and get back to normal. It’s quite a thing—and it’s visible—and that’s what gave me the idea for the word. The first word of this Miresua compound word, which means firewood, is singular instead of plural. In other words, puge instead of the plural, puget. Outstanding. Notice the Horse Gate (Emrakh Hrazefi) logo in the lower right in place of the Obama “O” logo. A lot of work went into this, and it deserves a wider audience, so I’m posting about it here. 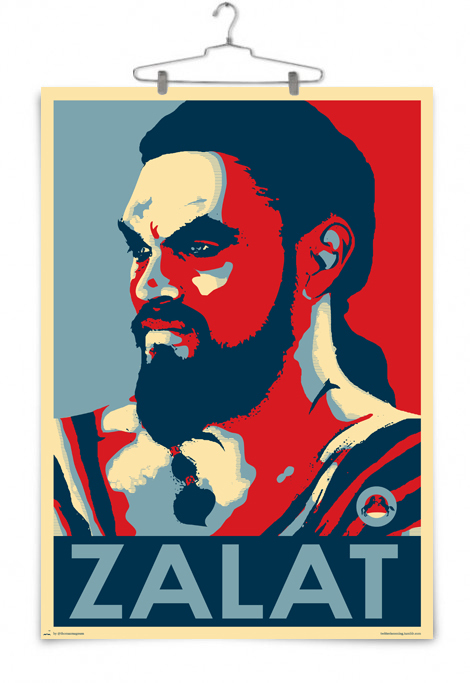 No doubt those who know a bit about Dothraki will have a question about zalat as it’s written there. It certainly does mean “to hope” or “to want”, but I think that the infinitival form might not be the one wanted here… In English (as in Hawaiian), we have single words (or word forms) that serve many, many different functions. In Dothraki, these forms don’t always line up one to one. As you can see, the English leaves much to interpretation (which is always fun. Dothraki does the same thing elsewhere in the language). Interpreting the original poster in at least one way would, I think, call for the infinitive; I’m just not sure if that’s the way we’re supposed to interpret it. Okay, from circumstantial evidence, I think it’s supposed to be a noun. That said, I think ZALAT looks better than ATHZALAR. It’s simpler. Anyway, I thought the poster was pretty cool, so thought I’d share. I was also planning to work in the word for “market”, but since I can’t think of a clever way to do it, here it is, zhey Daenerys: jereser. The Western Market would be Jereser Jim, and the Eastern Market Jereser Tith. Posted in grammar | Comments Off on Yes You Khal! This is the word for “crowd”. It looks vaguely singular until one realized that the underlying form is -tānaj-. The (hypothetical) singular form of such a word would be matānaja. Adding an -i to make a collective (-i is collective with animates and plural with inanimates.) produces matānaji which simplifies to matānae. And they opened the gates and made a crowd beyond it and called to him still, but none came to this side. simban- (transitive verb), imperfective simbanaram: to rip, tear, tear apart. Spec Tech: Conlanging 7 — Who’s what? This is the seventh in a series of posts “live-blogging” the creation of a fictional language from scratch, with the help of our readers. We plan to construct a functional language one piece at a time, incorporating suggestions and preferences from our audience along the way. You can find a listing of our previous installments here, and a spreadsheet listing the words in our language here. Before we get started today, I want to address a question from the comments on the last post: if Kohen has a set word order for subjects and objects, why do we also have particles to mark subjects and objects? There’re two reasons to have our subject and object markers in addition to word order. The first is that, by having subject and object markers, we get some flexibility in our word order that we can use for larger, discourse-oriented functions like emphasis — we might decide later that we can, for example, move a subject or an object before the verb to emphasize it. It’s also possible that we’ll discover as we work through our grammar that these particles are useful for clarifying things that might otherwise be ambiguous, especially in constructions with, e.g., relative clauses. The second reason is that having both markers and word order provides redundancy. Languages do a variety of things that aren’t strictly necessary to convey meaning, but that aid others in understanding what’s been said. If you’ve studied Spanish or French or Latin or German and dealt with making adjectives agree in both gender and number, you’ve encountered this tendency. The /s/ that goes on the end of English verbs in the present tense for third-person singular subjects (e.g., “He runs for the bus”) is another example of this kind of redundancy. We don’t get the /s/ except when we have the word “he”, “she”, or “it” for the subject (or a noun), so the /s/ doesn’t actually add any information; we already know who the subject is. What this /s/ does add is that, in a loud, crowded room, it can help you reconstruct what someone’s said, even if you had some trouble hearing them. Okay, on to two new things. The first thing to tackle today is how to deal with copular clauses — that is, clauses which, in English, contain the verb “to be”: “He is a doctor”, “I am a teacher”, etc. There’s a pretty large range of ways in which languages handle these constructions, from having a verb like in English to simply juxtaposing two nouns. In the interests of keeping our morphology and syntax relatively straight-forward, I think we should use the machinery we already have in place. To this end, if you want to say “He is a cat” or “That is my house”, treat the bit that comes after the “is” like a verb—put it first in the sentence, stick whatever prefixes for tense and aspect you need on the front of the noun, and follow it with the subject. Note that this construction is only for cases where the two nouns are essentially equal to each other, and is not for locations — we’ll deal with how to say that something is located somewhere in a future post. The second thing today is to start thinking about question words. Last time, we dealt with how to ask yes/no questions; now it’s time to think about information questions that use words like “who” and “what”. There’s a couple of ways we can go with this, and some things we need to decide. The second decision is what we want our question words to look like. In many languages, there’s often some obvious similarity between the different question words; in English, we can see this in the “wh” at the beginning of most of the question words. In Kohen, I’m thinking that all of our question words should start with the same syllable, maybe te-? What do y’all think about these ideas? How do you think we should do our question words? Weigh in in the comments! Posted in grammar | Comments Off on Spec Tech: Conlanging 7 — Who’s what? This refers to the feeling of eagerness. ānen anñiñēka would be “eagerly”. He was amazed, and they called to him with eagerness, and with caution, he went to them, to their gates. Notes: I was planning to do another word for today’s word of the day, but I happen to be watching the Rays and Yankees, and have been lucky enough to bare witness to one of the most incredible comebacks in pre-post season history. Down 7-0 pretty much the entire game, the Rays scored 6 runs in the 8th, and then, with two outs and two strikes in the bottom of the ninth, their season nearly over, their pinch hitter hit a home run to right to tie it. Just incredible. At the time of writing, the game is still going (it’s in the top of the tenth), so they may still lose it—and the Red Sox are still playing, so even if they lose, there’s still a slim chance they could get to the playoffs—but even so, what an incredible game! Baseball has done it again. The Tampa Bay Rays used to be called the Tampa Bay Devil Rays. Though a nova is not a devil ray, it’s in the ray family, so I figured it was close enough. Even though it’s curvy, I like this iku; kind of reminds me of the Queensrÿche logo. You are currently browsing the Conlangers blog archives for September, 2011.